I wasn’t too sure what this candle was going to smell like. Campfire and donuts? Sounded like an odd mix. 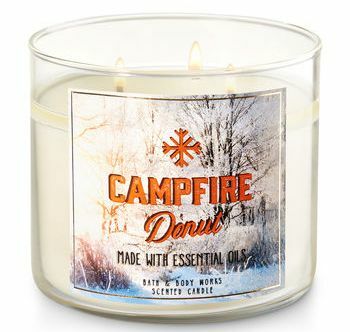 I love the scent of donuts though so I had to give this candle a try. Fast forward to receiving it and then popping off the lid… SWOON!!!! It smelled amazing!!!!! I swear, SWEAR it smelled like deep fried donuts. I didn’t smell a lick of smoke and I was perfectly 100% happy with that. Made with notes of powdered sugar, glazed donuts and cedarwood essential oil. I don’t smell any powdered sugar or cedarwood but I did smell glazed donuts and again, deep fried glazed donuts to be exact. It literally blew me away how yummy this candle smelled. So much so, I’ve already gone back onto Bath & Body Works site and purchased a few more just in case this candle goes bye-bye. YUM!!!!! I loved it. Now let’s see how this candle performs! I lit this candle in my master bedroom, hoping and crossing fingers it would be a room filler and drum roll… it wasn’t a room filler but it was still pretty decent. The scent… perfection! Deep fried yummy and scrumptious donuts all the way!! Did you read that? Let me say it again… deep fried, melt in your mouth, doughy, you will want to eat the whole box, donuts!! YUM! That’s what this candle smelled like to me. Perfect!! 100% perfect. I never did smell powdered sugar or cedarwood and I was perfectly okay with that. This scent was amazing just as it was. Strength – I would rate this candle a 7 in a really large room. 9/10 in medium to smaller rooms. This candle burned great. No wick issues. Clean burning from start to finish. I think it’s pretty safe to say I loved this candle. Interestingly, the reviews on Bath & Body Works show this scent at 3 out of 5 stars which surprises me. I didn’t think that at all but I guess it’s all in the nose of the beholder, isn’t it? I personally loved it and give it 5 stars but I’ll leave it up to you bakery lovers to see for yourself. 🙂 Go smell this candle if you get the chance. 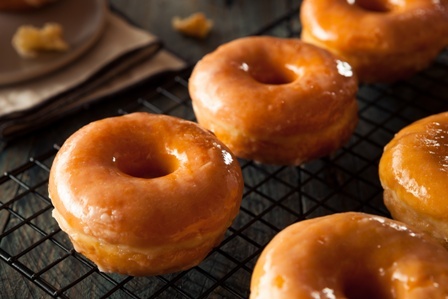 If you love the smell of deep fried donuts… I bet you’ll walk away with one. I’ve already gone back and purchased a few more to keep on hand. Don’t see this candle listed on Bath & Body Works website? Try one of their stores which tends to carry more fragrances than online.